Inspired by smittenkitchen's yoghurt panna cotta with honey and walnuts I created a simple version of this delicious summer dessert using chia seeds. The chia seeds are a great substitute for gelatine, furthermore they add texture and a cute polka dot effect. Mix and chill in the fridge for about 1 hour. 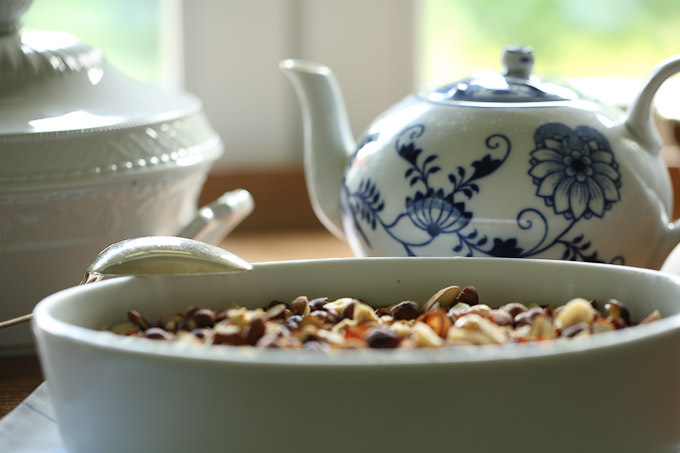 In the meantime roast the nuts you like: walnuts, hazelnuts, pine nuts, almonds. .... and top with the roasted nuts. Enjoy!